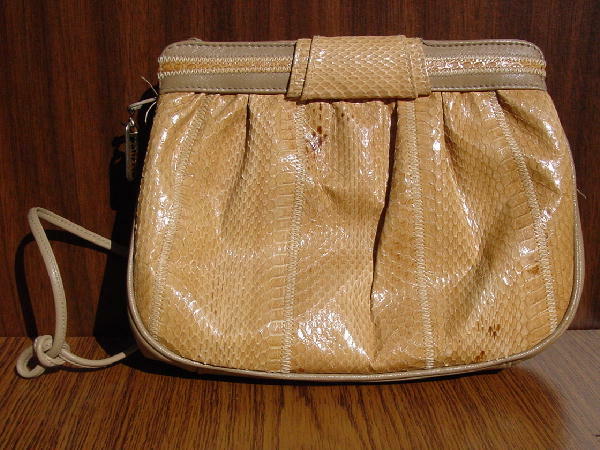 This vintage golden camel snakeskin purse has a honey-beige top inner and outer trim and a 30" shoulder strap. You could untie the strap and carry the purse as a clutch if you want. It has a center zipper closure and a zipper pull that says Palizzio on it. The interior has 2 sections, one of which has an open pocket and a zippered pocket. There is a very nice peachy-bone fabric lining. The front opening trim has snakeskin wrapped around itself. It's a very attractive looking purse. It was used only once, for a magazine photo shoot with a Robert Cary-Williams orange jacket, khaki BCBG cropped pants, and Marc Jacobs sandals.